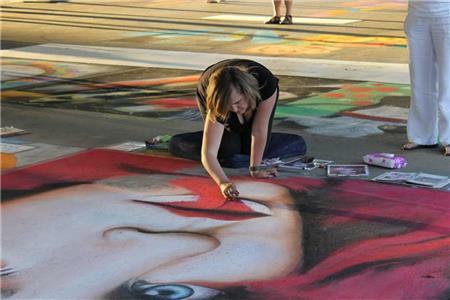 Chalk artist Jessi Queen is one of the featured artists for Patriotism at The Post. Ms. Queen has been a chalk artist for over 10 years and specializes in fantasy and nature themed portraits. Patriotism at The Post is adding chalk art to the 2018 festivities for the first time. Georgia Chalk Artist Guild co-founders, Zach Herndon, his wife Jessi Queen and guild member Meg Mitchell, will travel from Atlanta to participate and share their love and knowledge of chalk art while creating original art for all to see. Mr. Herndon and Ms. Queen founded the guild in 2014 to help promote street painting in Georgia. Ms. Mitchell has already shown her work locally as she was the featured artist at the Thriving Community Interactive Art Walk on March 18 at Gilbert-Stephenson Park. Each artist will have a 6’ x 6’ square to work with. Those wanting to compete for prizes must register at the information table. A basic palette of chalk will be available at no charge. Artists are encouraged to bring their own chalk and equipment to use. Community space and chalk will be available for anyone who just wants to be a part of all the fun. Judging will take place at 8 p.m., with the winners announced and awards presented before the fireworks show. For more information contact chris@6thcavalrymuseum.com or call 706-861-2860.